Singer/songwriter trio Brother Sun will appear at the Cellar Stage Baltimore on Friday, April 29, 2016. 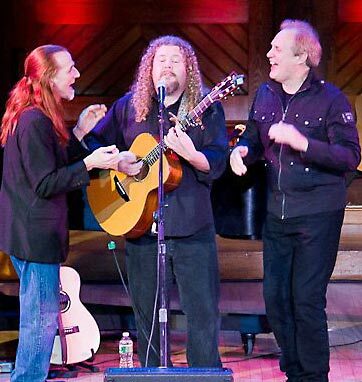 Brother Sun (Joe Jencks, Pat Wictor, and Greg Greenway) bring their harmonies to the Cellar Stage in Hamilton on Friday, May 1, 2015. Brother Sun warms up Cellar Stage TONIGHT! It’s chilly and rainy today so come to Cellar Stage where Brother Sun will warm the room with great songs and harmonies. Pat Wictor, Joe Jencks, and Greg Greenway promise a full evening of wonderful music. Tickets will be available at the door (cash, checks, credit/debit cards). Comments Off on Brother Sun warms up Cellar Stage TONIGHT! Brother Sun (Pat Wictor, Joe Jencks, Greg Greenway) will perform at Cellar Stage on Friday, Feb 8, 2013. Tickets.